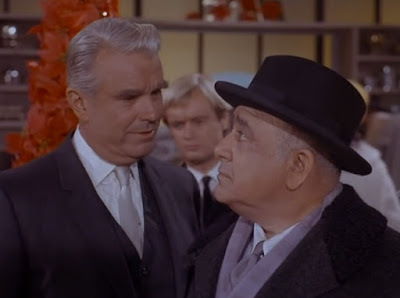 In the holiday spirit of giving, I bring you the crappiest Man From U.N.C.L.E. episode ever made. 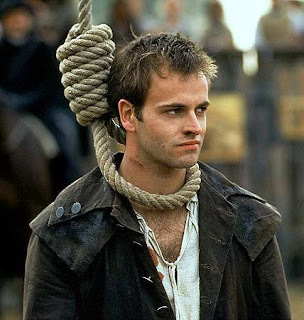 Oh, sure, a case for that honor can be made in favor of a handful of other episodes, but for my money, this wan, schmaltzy, tedious, bizarre offering is as terrible as this (mostly wonderful) show ever gets. Yeah, I’ve seen the episode where Napoleon dances the Watusi with a gorilla, and yeah, it’s pretty awful. This is worse. Fun historical tidbit: Back in early 1966, when U.N.C.L.E. 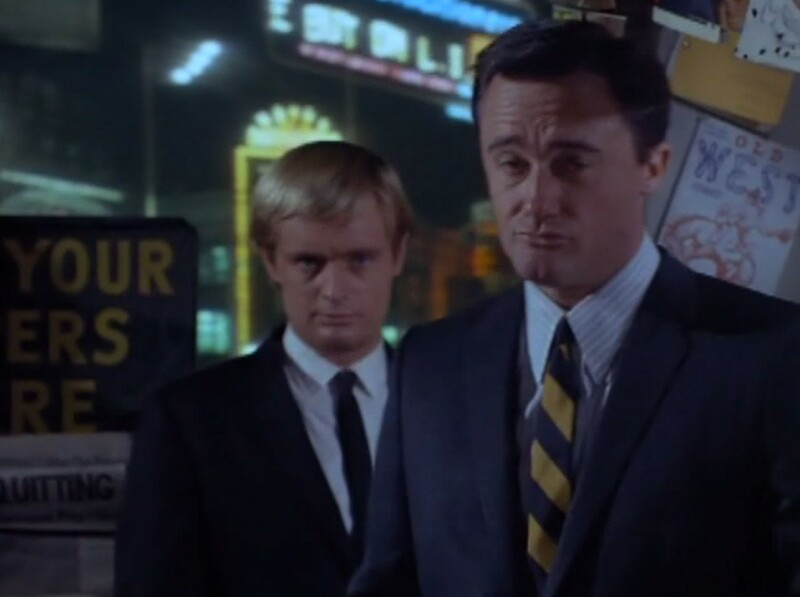 was on the rise and teen girls everywhere were in the wild grip of Illya-mania, David McCallum was scheduled to sign autographs at the flagship Macy’s department store in Manhattan. The store could safely accommodate three thousand fans; fifteen thousand showed up. When the appearance was canceled due to security concerns, the fans stampeded, causing massive damage to the store and necessitating the arrival of the riot police. 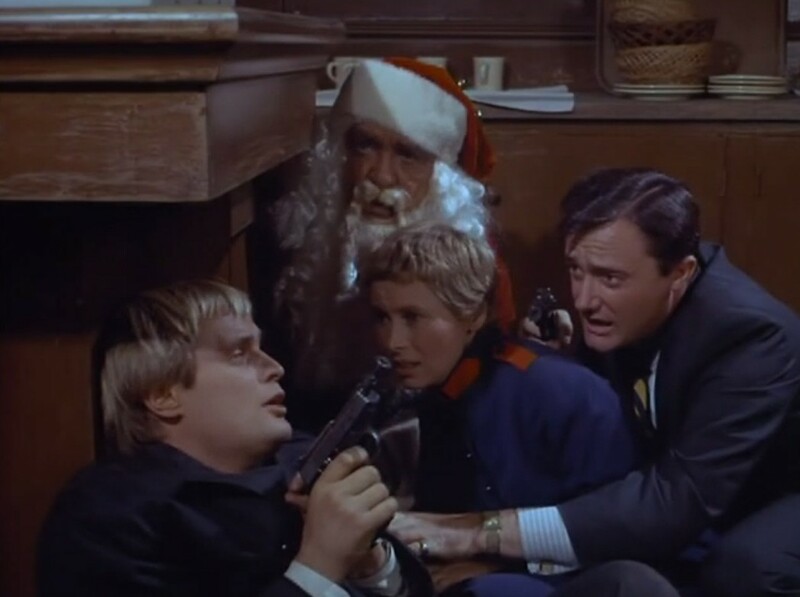 As it turns out, though, this would prove to be only the second-most catastrophic Man From U.N.C.L.E.-related incident to ever take place at a Macy’s. The most catastrophic? Yep. “The Jingle Bells Affair”. 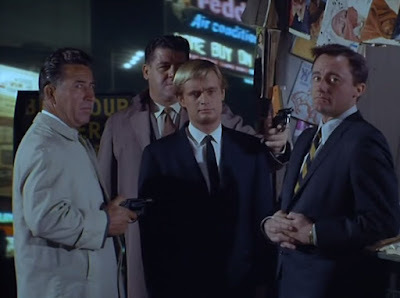 Illya and Napoleon are serving as bodyguards for Chairman Koz (Akim Tamiroff), the powerful leader of an unspecified Slavic nation (which is clearly meant to be the Soviet Union, though it’s never overtly identified as such), who is in Manhattan to deliver an important speech at an assembly of the United Nations. Despite his fervent anti-capitalist beliefs, Koz has recently begun entertaining the possibility of peace between his country and the United States. Midtown traffic is stalled, thanks to the Macy’s Thanksgiving Day Parade. Napoleon and Illya explain the concept of Macy’s to Koz and his sinister security chief, Radish (Leon Belasco). Someone on U.N.C.L.E.’s writing staff decided “Radish” was a plausible Russian surname, which should give you some idea of the level of attention to detail in this episode. In the course of their discussion, Illya comes out in favor of rampant consumerism, which is an odd position for a Soviet national to take, but whatever. This episode has bigger problems on the horizon. Outside Koz’s hotel, someone lobs a small bomb at him. Napoleon and Illya demonstrate their usual level of quick-thinking steely professionalism: Napoleon tosses the bomb at Illya, who whacks it with a metal shovel and knocks it into a trash can, where it explodes. Out of gratitude for saving his life, Koz presents Napoleon and Illya with medals: Napoleon receives the Sergei Brutkin Award for Coexistence, while Illya receives the Elena Brutkin Award for Coexistence. Sergei and Elena, it turns out, were citizens of Koz’s nation who were married for eighty-seven years. Congratulations, guys! I’m pretty sure this means Illya and Napoleon are now legally married in Russia. I have no idea what was going on behind the scenes here, but Vaughn and McCallum will both spend this episode looking like they’re a nanosecond away from bursting into tears and storming off the set. What the hell, Man From U.N.C.L.E.? This is not good. This is not subtle. As Mr. Macy spouts excited platitudes about the store (“Macy’s cares a great deal about all of our customers!”), Vaughn and McCallum hover in the background of every shot, wraithlike, their expressions reflecting a mounting existential horror. 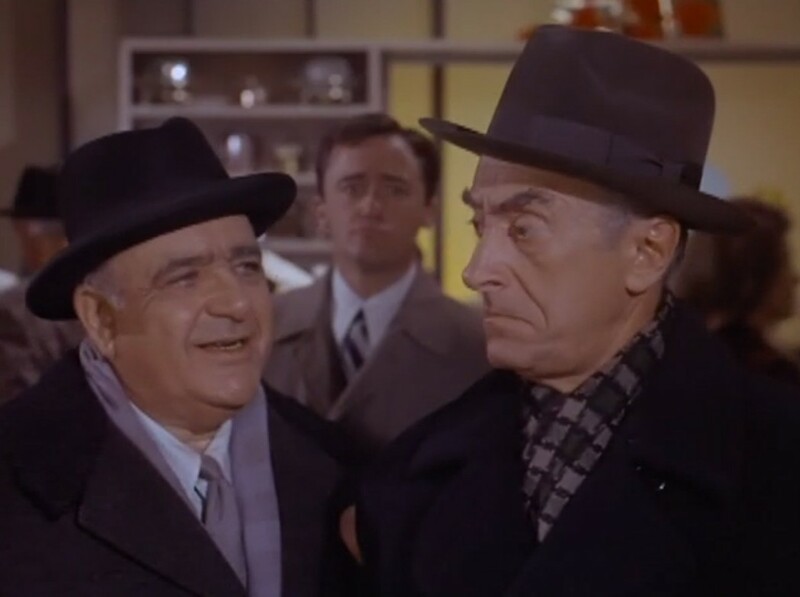 Radish secretly meets with the bomb-lobbing would-be assassin, Pifnic (Leonid Kinsky), and tells him to step up the attacks on Koz. Radish, who disapproves of Koz’s growing feelings of perestroika, reveals himself as the mastermind behind the attempts on his life. 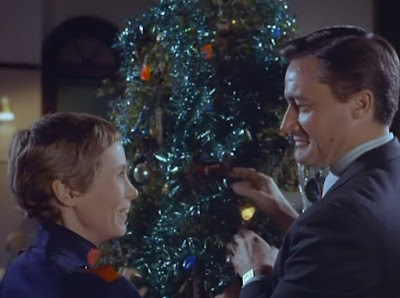 Koz, increasingly charmed by modern American society, visits a local Salvation Army meeting place, where a pretty young Salvation Army officer named Priscilla (Elen Willard) is training local Bowery vagrants in the fine art of being Macy’s official Santa Claus. 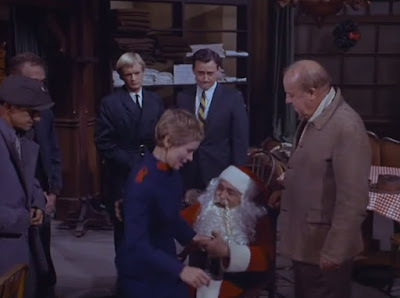 Koz dons a Santa costume and tries his hand at it, while Vaughn and McCallum stand around and wordlessly contemplate mutiny. Pifnic and a slew of heavily-armed gunmen storm the meeting place, guns blazing. While Illya and Napoleon fend off the assassins, Koz and Priscilla flee up to the rooftop and escape. 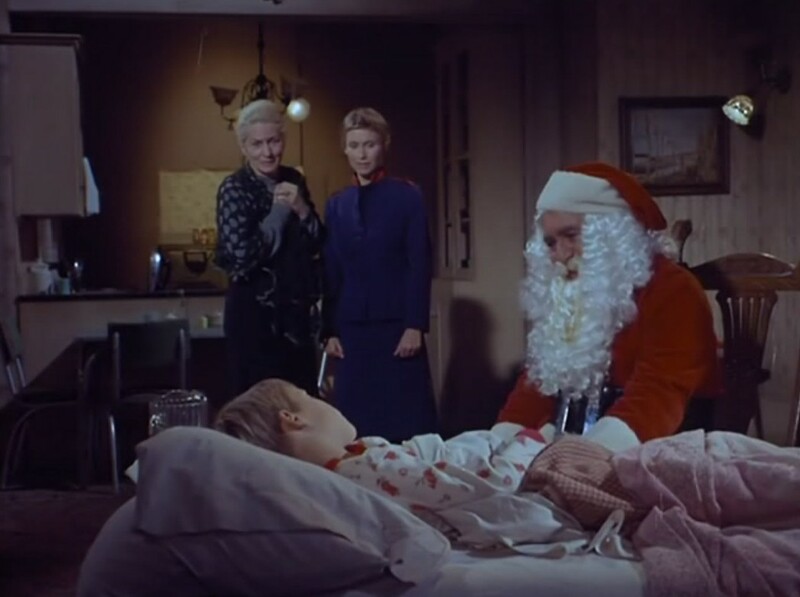 Priscilla takes Koz, still in his Santa outfit, back to her apartment, where he pays a visit to her neighbor’s deathly ill young son, Alex. Touched and alarmed by the sight of the sick child, Koz arranges for his personal physician to treat the boy. Having lost all contact with Koz in the melee, Illya and Napoleon slump back to U.N.C.L.E. 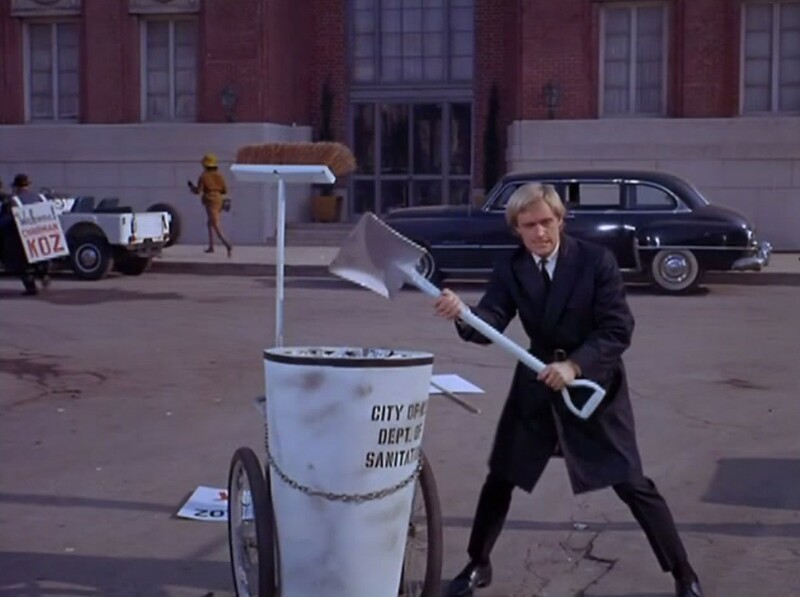 headquarters, where Mr. Waverly bawls them out for their rank incompetence. He orders them to apologize to Koz for being such miserable bodyguards. “In the absence of efficiency, we’re compelled to resort to charm,” Waverly says. Heh. That’s rather wonderful, actually. Napoleon and Illya should adopt that as their official motto. 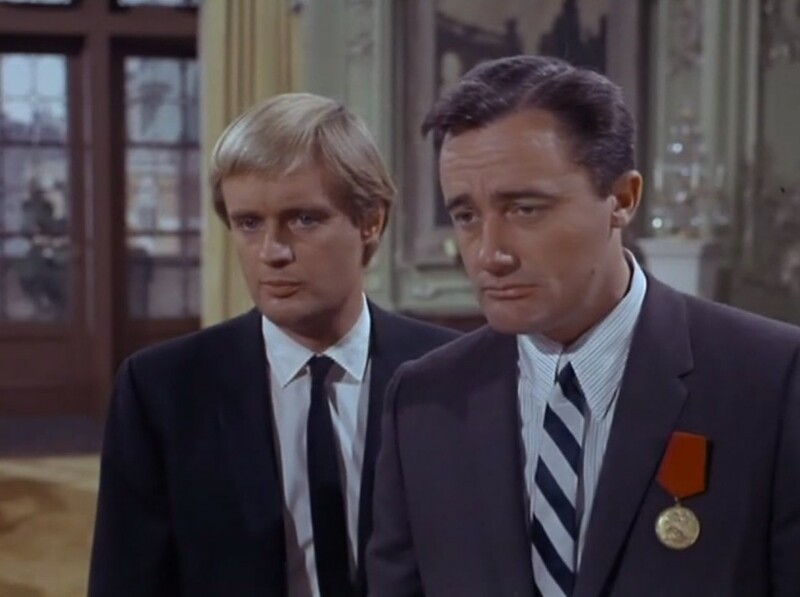 So Napoleon and Illya head over to Koz’s lavish hotel suite and attempt to make amends. Koz is having none of it. He’s irate over the latest assassination attempt, which he believes was made by violence-happy Americans trying to thwart his peace initiative. He rants and bellows and pounds his shoe on the table in a Khrushchev-esque manner, then declares his intention to renounce his plan for peace at his speech to the United Nations. Illya and Napoleon spy on Radish and overhear him plotting with Pifnic to plant a bomb in Koz’s limousine. Before they can apprehend Radish, they’re overwhelmed by his henchmen, who surround them and hold them at gunpoint. Illya and Napoleon can’t be bothered to care about this development. 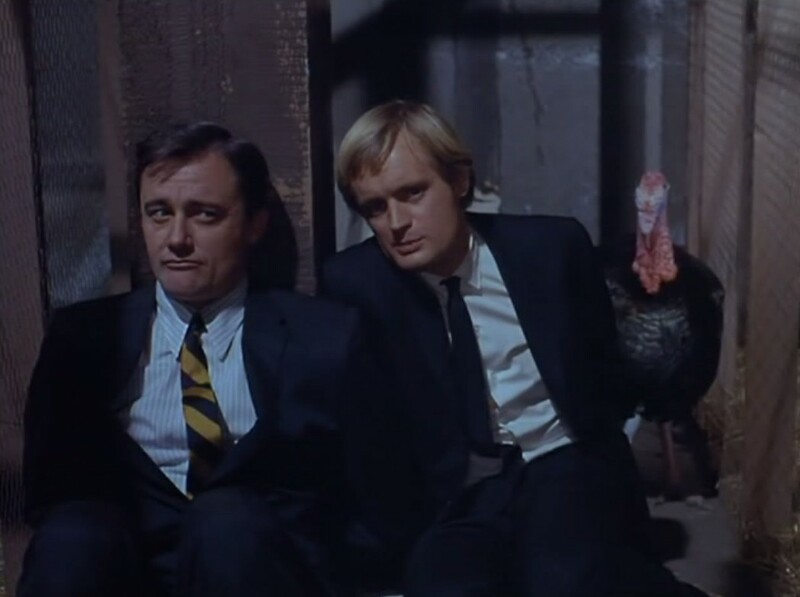 Radish and his henchmen tie Illya and Napoleon up and dump them in a pen filled with live turkeys. It’s all good, though; the turkeys peck through their bonds and set them free. 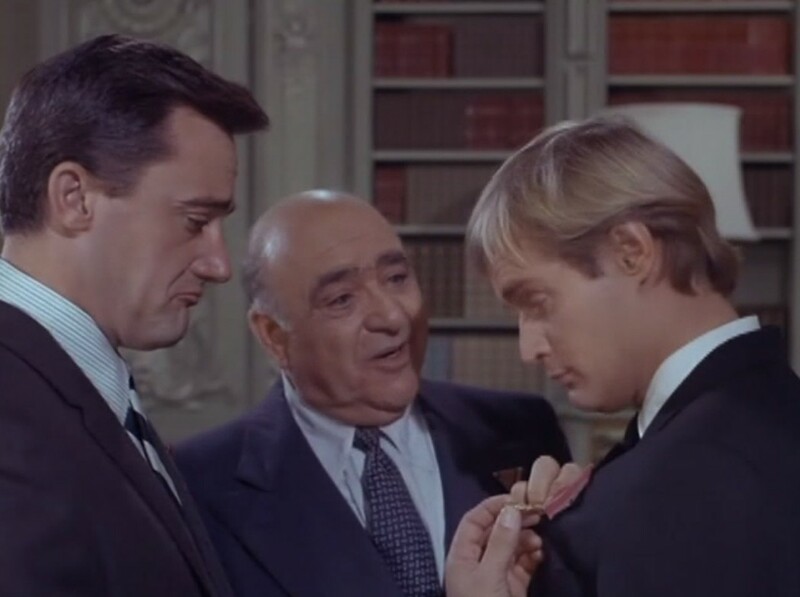 Napoleon and Illya race to warn Koz about the bomb in his limousine. 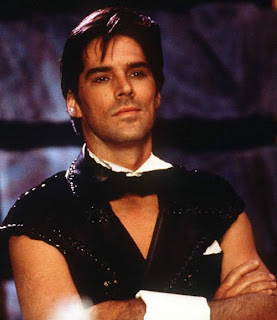 Koz, meanwhile, has already abandoned his limo in stalled traffic to accompany Priscilla to the hospital: Sick young Alex is refusing to take his life-saving medicine unless Koz-as-Santa comes to visit him again. The bomb detonates harmlessly, which Koz decides to view as a Christmas miracle. The episode ends at the children’s hospital, where sick little Alex is making a miraculous recovery. While decorating a Christmas tree with Priscilla, Napoleon makes a cheeky comment about mistletoe. “Oh, Mr. Solo, you are a gay one, aren’t you?” she giggles. Napoleon looks taken aback for a moment, then recovers. “Only on holidays,” he replies. Only on holidays. Bless you, Napoleon. That exchange almost redeemed the episode. And then Koz and Mr. Macy sail into the hospital, arms filled with festively-wrapped toys from Macy’s. 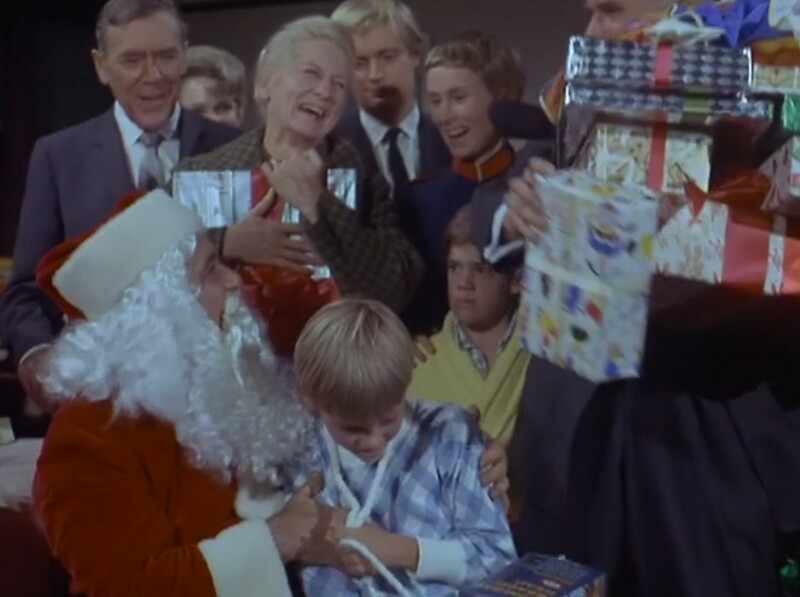 Mr. Macy offers Koz a position as an official Macy’s Santa Claus, and once again Napoleon and Illya find themselves shunted into the background of their own show. Holy hell. 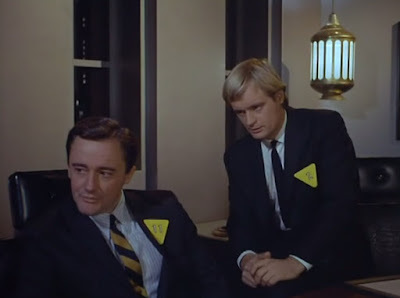 Whatever Macy’s paid you for this grotesque, extravagant level of intra-episode product placement, Man From U.N.C.L.E., it wasn’t worth it. Holy smokes! During the first ten minutes of this I thought, "this isn't so bad - I wonder why it's got such a bad reputation?" Then I watched the rest of the episode, and I understood. I'm just glad MFU wasn't broadcast on the other side of the Iron Curtain, or the Cold War might have turned hot! Incidentally, I'm convinced that by this stage the writers had forgotten that Illya was meant to be Russian. Oh, yeah, IT'S SO TERRIBLE! The only real entertainment value lies in the way Vaughn and McCallum keep pulling these terribly sad faces in the background of every shot. 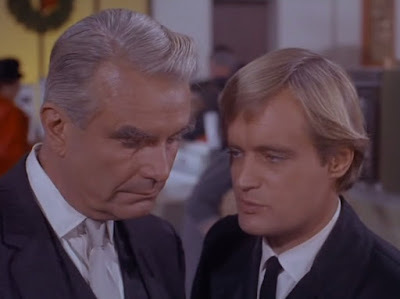 And yeah, the writers have totally abandoned the idea of Illya being Russian. Weird. I get the feeling Mr waver waverly was punishing them both for some misdemeanour. Either that or he's a thrush double agent.